Del Webb At Rancho Del Lago is an active adult community in Vail AZ. Vail is about 20 miles South of Tucson just off I-10. Del Webb At Rancho Del Lago is a gated neighborhood started in 2008. A 14,000 square foot club house is a focal point for Four Seasons Rancho Del Lago. The club house boasts many outstanding facilities. A fitness center and studios for dance, art and crafts are available. Outdoor amenities also put the “Active” into Active Adult Community at this Del Webb At Rancho Del Lago. Residents have an 18-hole putting green, two swimming pools and sports courts for bocce ball, tennis and pickleball. Nearby are numerous lakes, tails for walking and biking and an 18-hole golf course. Del Webb At Rancho Del Lago will have 522 residences when completed. Individuals interested in a smaller community with many activities will be right at home. Residents experience a vibrant lifestyle. Del Webb At Rancho Del Lago has a full-time Lifestyle Director. Activities include special events, hobby activities, day trips and more. Special interest clubs abound as well. There is also a full-time Fitness Director on-staff to plan and coordinate activities. There are 12 single-family floor plans from 1,200 to over 2,800 square feet. Del Webb At Rancho Del Lago homes have at least 2 bedrooms and 2 baths. Each home has an front and rear load 2-car garages. All homes are built have designs with energy saving options. Views of the Rincon Mountains and the desert landscape abound. Want to find a house for sale Tucson using the Tucson MLS? We can help! 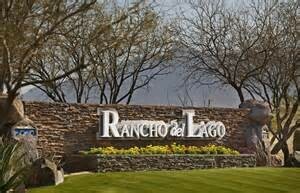 Questions about the Tucson Real Estate Market of Four Seasons Rancho Del Lago home for sale? Give us a call 866 316 5575 OR Submit Our CONTACT FORM and we will get right back to you! Learn more about Vail Arizona.